It proved to be too late. It proved to make no show. To die I was condemned. To bid her last farewell. It’s a quarter after two. We think of the 1960s and 1970s as the heyday of Minnesotans in national politics — the era of Vice President Hubert Humphrey, Vice President Walter Mondale, and democratic presidential candidates Eugene McCarthy, Humphrey, and Mondale. In fact, there had been presidential candidates from Minnesota before. One of them was William Windom, who gave his name to the town of that name (although his home was Winona). 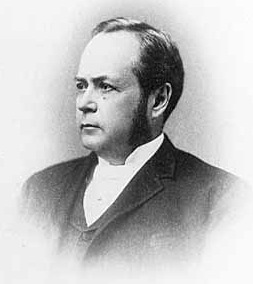 He spent about a decade in the House of Representatives in the 1860s, then was appointed Senator after the death of Daniel S. Norton (Blegen, p. 290). Then came the 1880 presidential election. The Republicans had two big name candidates, James G. Blaine and former president Ulysses S. Grant. And both had very large groups of delegates who disliked them. In the end, six different names were placed in nomination: Grant, Blaine, Senator John Sherman (the brother of the Civil War general), Congressman Elihu B. Washburn (who, once upon a time, had caused Grant to be appointed Brigadier General), Vermont Senator George Edmunds, and Windom (PresElectII, p. 1495). Windom never attracted much support; a newspaper of the time called him an “honest but rather superficial and showy man” (PresElectII, p. 1494), and on the first ballot at the Republican convention, Grant had 304 votes, Blaine 284, Sherman 93, and the other three combined had only 75 votes (PresElectII, p. 1495). Obviously no one had a majority. It took more than thirty ballots before the deadlock was broken. 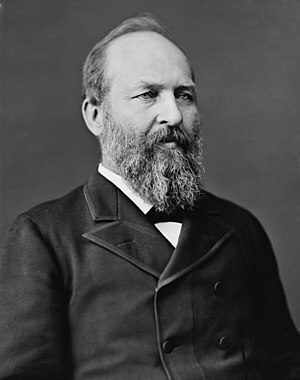 James A. Garfield had addressed the convention at one point, and had managed to seem very presidential. And a few people were plotting to get him nominated. After all those dozens of ballots, a few states swung to him, and that started a landslide. After three dozen ballots, Garfield — who hadn’t even been nominated or an official candidate — was the Republican nominee (PresElectII, p. 1496), with Chester A. Arthur the vice presidential nominee. Garfield had been a general in the Civil War, as well as a congressman, and the Democrats answered with their own soldier, Winfield Scott Hancock, one of the heroes of Gettysburg. It was an unusually dull campaign; both sides relied on whoop-it-up music and lies and avoided the issues as carefully as possible. (One of the Republican campaign songs poked some fun at Hancock’s campaigning on the issues; Republicans used the tune of Gilbert and Sullivan’s “When I Was a Lad” to portray Hancock singing “In the Union War I fought so well That my name is greeted with the ‘rebel yell'”; PresElectII, p. 1508). Garfield went on to win a close election, but that wasn’t the last that the Republicans heard of Windom; he was appointed Garfield’s Secretary of the Treasury (Blegen, p. 290), and helped Garfield implement a scheme to reduce the public debt by redeeming high-interest bonds with those bearing a lower interest rate (Rutkow, p. 73). Then tragedy happened. Garfield was shot by a disappointed, half-mad office-seeker, Charles Guiteau. Garfield was shot on July 2, 1881; he died September 19. Windom left the Treasury in November, but was re-appointed to the post by President Harrison in 1889, serving in the post until 1891, the year he died. The story of Guiteau shows how much our society has changed since Garfield’s time. 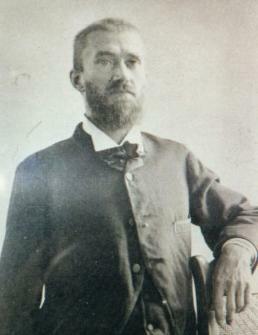 Guiteau was “a short, scrawny forty-year-old, who, although a self-educated lawyer, fancied himself more a world-class theologian and novelist.” In fact, he was a nut — the son of a schizophrenic mother and a religious fanatic father, he was a petty thief given to incoherent political speeches who nonetheless thought he deserved to be consul to Paris! (Rutkow, p. 71). The White House had no security arrangements at this time, so he was able to gain admittance several times to pester Garfield, his wife, and his clerks about a job. He didn’t get one, but he was later able to approach Garfield at a train station and shoot him. It was an incompetent assassination; Rutkow, who is a surgeon, notes that had Garfield been taken to a modern hospital, he would have been treated, released a day or so later, and surely have survived. Even in 1881, he should have lived; by this time, Joseph Lister had demonstrated the value of antiseptic techniques. But Garfield was placed in the hands of an incompetent who didn’t believe in cleaning his hands (he didn’t even believe in stethoscopes!). Garfield did not die of his wounds; he died of his doctors jamming him full of bacteria. Source: This song has never been collected in Minnesota, but Stout had five Iowa versions, and there is at least one from Illinois, and one from Ohio; the odds are good that it was sung here. This version, however, is based on the recording by Kelly Harrell; this is perhaps the most popular old-time recording of the song and will be most familiar to listeners.